Limited Spaces Available! For reservations call 888-557-3330. Spaces are extremely limited this time of year so book early to ensure the date you want. This exhilarating hands-on eco-tour visits three different bays off the Sea of Cortez. This fully-guided ecological excursion is one of the most popular tours for active individuals with a thirst for a workout on their tours. You'll never forget touring the panoramic seascape off Los Cabos from a sea kayak. You'll also have the opportunity to snorkel at some of the prime locales in the Cabo San Lucas area andndash; all on one thrilling tour. You'll be astounded by the clarity of the water at your snorkeling locales. Each bay provides excellent visibility because the bays are geographically sheltered from the rougher waters and wind on the Sea of Cortez. You'll travel from beautiful Twin Dolphin Bay to the government-protected waters of Bahia Santa Maria and Bahia Chileno (andldquo;Bahiaandrdquo; is Spanish for andldquo;bayandrdquo;). The remarkable variety of corals, sponges, sea urchins and colorful tropical fish that populate these bays will astound you. You may also spot rays, eels, octopi, and even reef sharks. Our friendly English-fluent guides will provide an orientation covering safety and proper kayaking techniques to all participants before departure. Our guides are not only expert kayakers, but are also well-acquainted with the best snorkeling spots as well as the local sealife. All of the necessary kayaking, snorkeling and safety equipment as well as snacks and non-alcoholic beverages will be provided. We are also pleased to provide round-trip transportation from any accommodation in Cabo San Lucas, the Golden Corridor or San Jose del Cabo. Cabo Snorkeling Tours is always interested in your tour experience with us. We hope you enjoyed your tour and love to hear comments. 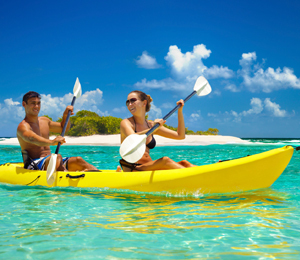 I have been to the Bahamas many times, but Three Bay Kayak and Snorkel is one of my favorite trips! It includes everything that everyone should do here. As a Bahamas veteran, I can say only the best about this experience!